The international community can no longer ignore the plight of Myanmar’s Rohingya, writes Nancy Hudson-Rodd. In the last few days, hundreds of Rohingya, a persecuted Muslim minority from Myanmar, have washed up on the shores of Indonesia. According to some reports, many more thousands are still stranded at sea. The mass exodus speaks volumes for a Myanmar apparently on the march towards political and social reform. Myanmar’s regime is not ‘backsliding’ on commitments to democratic rule so often misleadingly reported. There was no commitment to democracy, instead two major goals: the maintenance of military rule; and the final eradication of 800,000 plus Rohingya. What uncomfortable times to live in, times of general amnesia when the spin of Burma is applauded as the ‘truth’. Nations chose to believe a hypothetical future of democratic rule promised by Thein Sein, a former top general chosen in 2010 to be the front man for the old regime with a new façade. The 2010 election results were approved despite procedural irregularities, voter intimidation, ballot manipulation, thousands displaced in Eastern Burma unable to vote, international monitors and reporters denied access, and political prisoners held. Aung San Suu Kyi, an international icon of human rights, when freed declared herself a politician, denied she was ever “a human rights defender”. She has supported the regime in their sham quest for democracy, the case of mistaking mirage for water. The military has carefully planned continued rule in the 2015 elections. Newly appointed Prime Minister General Khin Nyunt pledged to hold elections at an unspecified future date in his inaugural 30 August 2004 speech. He announced elections, as the final step of the State Peace and Development Council (SPDC) “roadmap to democracy”. Khin Nyunt’s speech was broadcast on Burmese state televisions and the sole national radio program, with no reporters allowed to cover the event. The UN Special Rapporteur on Human Rights Situation in Myanmar and the Special Envoy to the UN Secretary-General were denied entry visas in 2004. They wanted to verify reports of increased arrests; “security detainees” given harsh prison sentences for writing, speaking, or peacefully protesting the Constitutional process which denied public comment and participation. This visa refusal, in retrospect, revealed the nature of democracy on offer in Burma. On 10 May 2008, the regime declared the Constitution overwhelmingly approved in a fraudulent referendum process, held during devastating Cyclone Nargis. It kept troops on stand-by to crush popular unrest, rather than mobilise them for emergency and rescue missions while blocking offers of emergency aid missions from regime-friendly China and India or hostile Western powers such as USA, France and UK. To top it all off, 21 Burmese aid workers were imprisoned for helping survivors. Zargana, comedian and blogger, was sentenced to 59 years in prison, for criticising the regime’s cyclone response on BBC. He was released in 2011 as part of a general amnesty, after having his original 59-year sentence commuted to 35 years. For weeks post-cyclone, a State-run media campaign accused citizen journalists and international reporters of trying to destabilise the government, claiming on state-television that the impact of foreign media intrusion was worse than the cyclone. From the outset, the regime’s roadmap was to install “discipline flourishing democracy”. Generals would play the role of whips, lest unruly masses, defiant dissidents, autonomy-minded minorities stray from the military’s path towards a warped neo-totalitarian dystopia. Lt-General Thein Sein, Secretary 2 of the State Peace and Development Council (SPDC), was in charge of drafting a Constitution (1993-2006) of their design. As President, he explained in 2012 why it took so long to complete. “Actually, we could have wrapped all of it up in a day, but there’s a need to make it look good, isn’t there?” He rejected all proposals by ethnic and other groups, but included a clause to protect current and former military leaders, from prosecution for crimes committed. Perpetrators of crimes against humanity and war crimes, including the current Home Affairs Minister, sit in parliament, reported Harvard Law School’s International Human Rights Clinic in 2014. Army chief senior General Min Aung Hlaing confirmed in January there would be no 2015 pre-election Constitution amendments concerning military representation in parliament while conflict continues. The military can dissolve parliament anytime to “maintain the peace”. War is constant. The military commits copious abuses, terrorising civilians. Yet, only three per cent of the 1.5 million people requiring urgent support are assisted by UNHCR (2015). The UN General Assembly resolution to create a UN Special Rapporteur for the situation of human rights in Myanmar was based on, “continued seriousness of the situation of human rights including imposition of oppressive measures directed in particular at ethnic and religious minorities….and deep concern for Rohingya” (UN General Assembly Resolution 46/132 of December 1991). The 2014 Myanmar Population and Housing Census, completed with international financial and technical support, was declared successful despite excluding over 1 million people, including 800,000 Rohingya – who were denied citizenship and right to their identity. We strongly reject the use of terminology ‘Rohingya’. The people of Myanmar do not and will not recognise such terminology since it has never existed in our ethnic history. We further reject the call to allow self-identification…a false term. Burma as 2014 ASEAN chair forbade reference to Rohingya. The word does not appear in Burmese state or independent media. An estimated 800,000 Rohingyas were forced to surrender all temporary white ID cards by 31 March this year. These withdrawn cards, issued under the 1949 Burma Residents Registration Act, effectively strip Rohingya of legal documentation, their identity, and last right to live in Burma. No opposition groups came to the defence of the Rohingya. Certainly not Aung San Suu Kyi in her role as chair of the Rule of Law and Tranquillity Committee. Since being released from house arrest in November 2010, she has travelled widely, meeting royalty and the powerful, collecting her ‘human rights’ awards. Alas, she has found no time to take an hour flight from her lakeside house to visit the semi-concentration camps in Rakhine state, where nearly 150,000 Rohingyas are locked up; for their own protection of course. Since 2012, these Rohingya, illegalised and dehumanised, remain locked in squalid state-controlled internally displaced persons(IDP) camps, isolated behind barbwire, guarded by machine-gun wielding security troops. Seventy per cent of Rohingya have no access to enough food, safe water, sanitation, and health care. Malnourishment for children under five is double the national rate, individuals are dying. The regime severely restricts humanitarian help. UN premises and most international NGOs were attacked and ransacked in 2014. Three local INGO staff are still imprisoned for speaking to international media, during the 2012 violent attacks on Rohingya. The regime denies holding political prisoners. Police, navy, army, state security forces, profit by trafficking Rohingya who escape by sea, a lucrative business worth up to $7,000 for each boatload of desperate people. The current destruction of the Rohingya as a distinct and self-identified ethnic group is not an isolated incident of religious or ethnic violence. 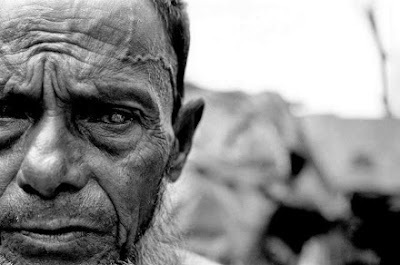 Based on three years of research into the plight of Rohingya, Dr Maung Zarni and Alice Cowley conclude that Rohingya have been subject to a process of “slow-burning genocide” since 1978. Both the State in Burma and the local community have committed four out of five acts of genocide as spelled out by the 1948 Convention on the Punishment and Prevention of the Crime of Genocide. Amartya Sen has thrown his formidable intellectual weight, supporting the genocide characterisation at a conference on the worsening plight of Rohingya held at Harvard University in November 2014. The Sentinel Project to Prevent Genocide concludes that the risk of genocide or related mass atrocities in Burma is extremely high. Violence, discrimination, and extrajudicial killings mostly directed toward the Muslim Rohingya, conducted by both state and non-state groups are both widespread and systematic. Bernard Kouchner, French politician, co-founder of Mèdecins Sans Frontiéres and Mèdecins du Monde filed an application of the responsibility to protect (R2P) in Burma on April 2015. His application has sparked considerable debate at the UN, within civil society, and among founders and proponents of the concept. All agree the regime denies adequate protection to civilian populations by obstructing aid, holding a referendum instead of providing aid, and stealing aid to help only the regime. They disagree on whether this situation is a case of R2P. Debate focuses on how to conduct protection in Burma, or even if it is needed. Despite growing evidence of genocide, the international community so far avoids calling this large-scale human suffering genocide. Is this due to nations framing the genocide in different terms (ethnic/ religious conflict, furthering a peace process, restoring order), or is it the denial of political implications? Government leaders agreed they had a responsibility to protect civilians from crimes against humanity, war crimes, ethnic cleansing, and genocide at the World Summit in 2005. If diplomatic, economic, and political means, do not effect change, then force is required. This month an international conference on the Rohingya will be held at the Nobel Institute in Oslo, Norway. There, some of the world’s iconic figures including George Soros; Archbishop Emeritus of Cape Town, Desmond Tutu; former Malaysian Prime Minister Mahathir Mohammad; Irish peace activist and 1976 Nobel Peace laureate Mairead Maguire; former Timor-Leste President, José Ramos-Horta; and former Prime Minister of Norway, Mr Bondevik will publicly call for the end of Burma’s policies of persecution and destruction of Rohingya. The R2P community internationally should stop splitting theoretical and legal hairs and join this credible chorus calling for the immediate end to the slow genocide of the Rohingya. As excruciating as this genocidal process is because of its slow-motion, decades-long nature, it does give the moral citizens of our world a chance to push for its end by speaking with one voice on this most heinous crime: Burma’s verifiably intentional destruction of an entire ethnic group simply because of their ethnic identify. It would be tragic if “Never Again” is allowed to remain an empty slogan by those who should know better — diplomats, world leaders, academics, journalists and informed global citizens. Dr Nancy Hudson-Rodd is a senior honorary research fellow and human geographer based at Edith Cowan University.